Due to the persisting drought, and to achieve a Stage 2 and 20% by the year 2020 water production reduction goal, The following state mandatory water use restrictions and Marina Coast Water District Stage 2 voluntary water use restrictions are in effect until further notice. Irrigation of ornamental turf in roadway medians and parkway strips is prohibited. Hotels and motels shall clearly offer guests a limited linen/towel exchange program. Restaurants shall not serve water to customers unless requested. Only apply irrigation water as needed (follow the MCWD Landscape Watering Guide). Eliminate or limit irrigation of turf to only two days per week or less. 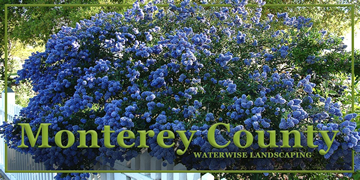 Limit irrigation of shrubs and ground covers to no more than two days per week. No person shall cause, or permit water to run to waste. Spray irrigation events shall only occur before 10:00 a.m. and after 5:00 p.m.
No person shall irrigate their landscapes at any time during or 48 hours after a rainfall event. Using potable water to clean driveways, sidewalks, or other hard surfaced areas, except where necessary to protect public health or safety, is not permitted. Using a hose for the permitted washing of buildings and vehicles without the use of an automatic shut-off nozzle is prohibited. Potable water should not be used in fountains, unless the water recirculates. Plumbing and irrigation leaks, breaks, or defects shall be repaired within 72 hours. Public entities shall display placards or decals promoting water conservation. Watering with recycled or other non-potable water may continue without restriction. Please review the District's Water Conservation Ordinance and Water Shortage Contingency Plan. To learn more about how to prevent water waste or how California is dealing with the effects of the drought, visit Drought.CA.Gov. To find out how everyone can do their part to conserve water, visit SaveOurH2O.org. Thank you for doing your part to conserve water in this time of severe drought! To participate and provide input on District policies and regulations, the public is invited to attend meetings of the Water Conservation Commission and the District's Board of Directors. To learn more about Marina Coast Water District meeting dates, rules, water efficiency programs and water use restrictions, visit the Public Meetings page or call us at (831) 384-6131. MCWD has free water-saving devices for all district customers. Come by our office at 11 Reservation Road in Marina to pick up water-efficient showerheads, faucet aerators, hose shut-off nozzles, and leak detection tablets. View or download the rebate forms listed in the right column to learn more about the following rebate and incentive programs. Up to $125 for retrofitting to a high-efficiency toilet with a flush capacity of 1.28 gallons or less. *Please contact us before you start your retrofit project, as these programs require pre-approval. For assistance with leaks, high water use, or efforts to conserve water, contact us at (831) 384-6131. MCWD's Water Conservation Coordinator is available at 384-6131 to answer any questions or help you out with water problems you may have. Design your own Water-Wise landscape. See the Engineering page for additional commercial and industrial forms.